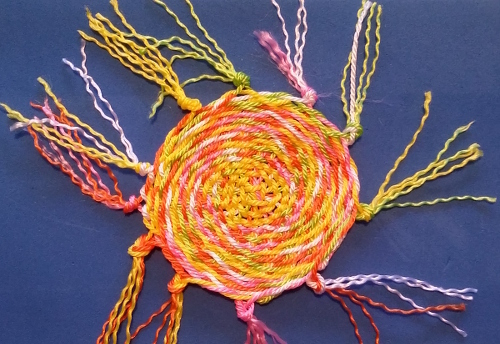 Three days, two workshops back to back, spent in the company of fellow NSW Basketry Association members, inspired and led by Mary Hettmansperger – what a fabulous experience! The first two days were Sculptural Basketry – soft materials, the third Sculpture, Surfaces & alternative designs in Baskets & Vessels. There is some waxed linen thread, coloured with acrylic paints. This is the only thing you could term “finished” – and it’s a potential input into other projects. 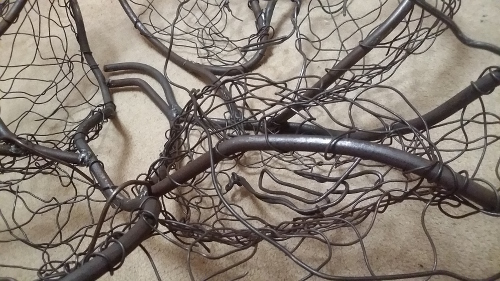 A barely started form in aviary wire, with three rows of knotting and the intended twining yet to begin. A complex form created with wire, pantyhose, glue and dress-making patterns, full of potential. Looping on a twisted and hammered wire form, progressing quite well. All exciting in their own way and with their own potential, but the most exciting thing is my notebook, filled with ideas and lists and diagrams with arrows. Mary’s underlying approach is just what I’ve been working on – creating components over time, ready as input to a faster, intuitive construction process. There were periods of quiet work throughout the days, punctuated with demonstrations by Mary when she threw out ideas, techniques, possibilities, alternatives… We all chose different things to experiment with over the time – I don’t think it would be possible to do it all. There was lots of metal play which I haven’t tried yet. I have lots of notes and photos, and plan to do my experimenting at home with the tools, materials and setup I already have. Furniture, vases and other oddments believed to have been his have been passed down through the family, including a small pile of shaped and engraved pieces of mother of pearl. Such counters were crafted in China and introduced to England by the captains of the East India Trading Company. These would have been used in bidding and scoring card games and were popular in the period around 1700-1840. 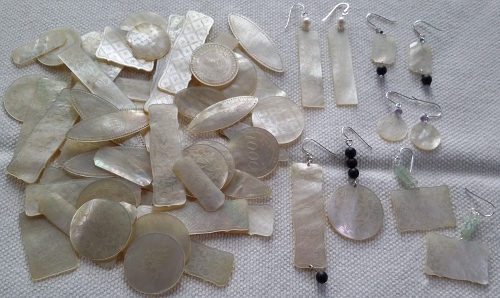 Mum recently agreed that I could use some of the pieces to make earrings for anyone in the family who wanted some. A few of us spent some time pairing up counters and beads over the recent family weekend. First results are shown below. (and before you look – from the photos I’ve realised there’s some rework to be done with poorly matched amethyst). 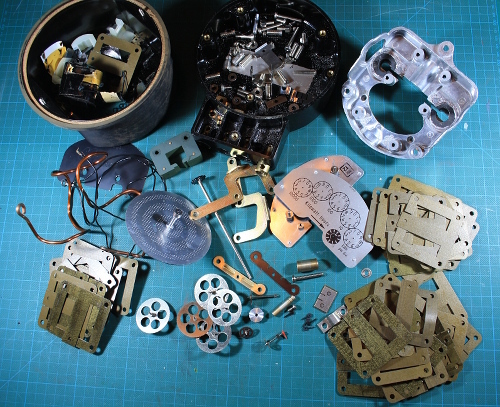 The photo on the right gives an idea of relative sizes – plus some of the pieces still available for a few in the family who were interested but haven’t decided details yet. A postscript – I’ve mentioned JCJ on this blog a few times before. 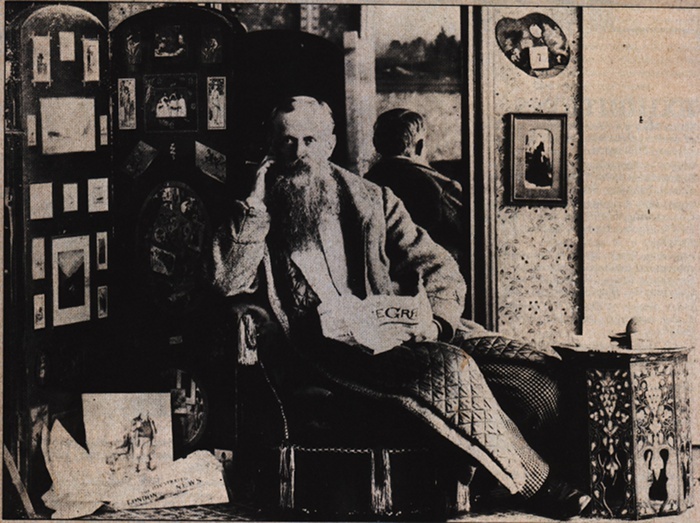 One of my favourites was an exercise in an Art History course in which I mixed family history with the requirement to act as a museum curator selecting artwork for a room in a terraced house. See 13-Oct-2013. After initial attempts making mobiles (20-Aug-2017), I’ve moved on to a stabile. I’d never heard of them before starting Keith Lo Bue‘s Poetry in Motion: making marvelous mobiles DVD workshop. They balance just like a mobile, but instead of being suspended they pivot on a table-based stand. Galvanised wire and corrugated cardboard. I had some idea of making a variety of shapes and painting them, then drawing/painting the result (following Gregory Hodge – see 31-Aug-2017). Perhaps as well weights could be inserted in the cardboard, causing some apparent “impossibilities” in balancing. The stabile isn’t right. Some clumsy connections that don’t hang well, the main balance is tilting to the side, obviously I haven’t gone on to painting, the “design” (let’s be kind) is awkward with parts hitting each other and the central support. Still, fundamentally it works! In other news, the ceramic earrings seen in progress 13-Aug-2017 are finally resolved, after multiple attempts. I’d rate them as OK, wearable, but not exciting. It was a good opportunity to play with wire, and a library of shapes is gradually building up. Neolithic twining? A video on Lanny Mackenzie’s instagram feed had me intrigued. I’m not sure my attempt is the same, but regardless it’s interesting. Unlike most weaving and basketry which structurally use two sets of elements – warp / rib and weft / weavers – this technique uses a single set of elements. Each length of material (yarn, wire, whatever – let’s call it “end”) follows the same pattern as every other. In her class Judy Dominic showed us that the same end can change function, a rib changing to weaver or vice versa. Neolithic twining, or whatever it is I ended up with, goes further – no differentiation. What possibilities does this bring? How could it be exploited? Later edit: just so I remember: working end goes over 2 (a and b) and under 2. new working end is b. repeat. First a mobile in .9 mm galvanised steel wire. About 16 cm high. Very simple, but a good exercise to practice skills. Next, I couldn’t wait to give earrings a go. I currently have asymmetrical hair, which is a wonderful excuse for mismatched earrings (not that I need any excuse). 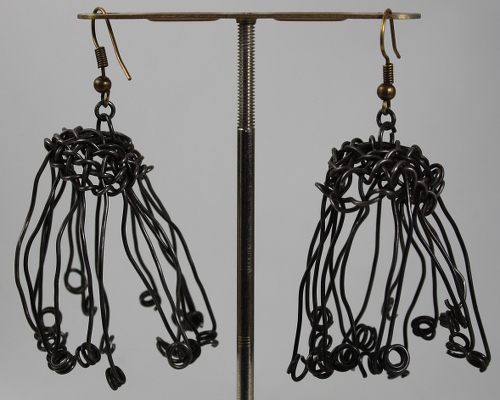 Design heavily influenced by earrings on Keith Lo Bue’s website. First the blurry action shot. And the detail shot. It’s .7 mm galvanised steel wire except for the earwires (salvaged from a bought pair of earrings), so avoiding prolonged contact of the galvanised with skin. The discs are shell, with some 4mm Miyuki cube beads. 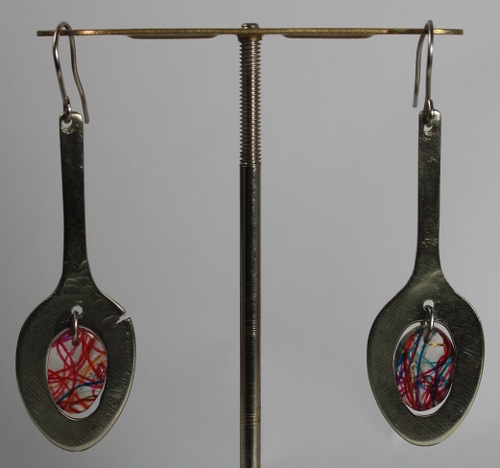 I spent ages trying to tweak the way the mobile earring hangs. Couldn’t quite get it, but in practice it moves pretty constantly so should look fine. Happy with these. … although all is trial and learning, nothing is error when playing ?? The sugar-tong-end earrings seen last week got new inserts. 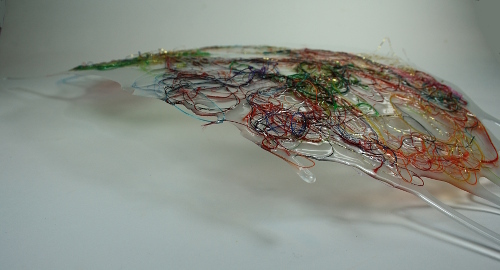 These started as sample p3-45 in the Mixed Media for Textiles course (23-Sep-2015), threads partially embedded in a thin sheet of resin. It turns out this stuff is easy to cut, sand and drill, and as I noted back then the thread effect is particularly effective when backlit. 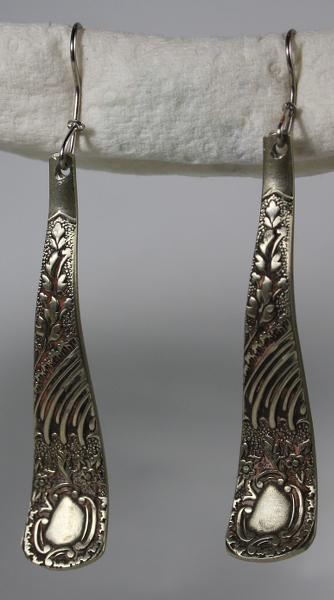 I wore the earrings in this form for a day, but they still looked like wearing spoons. Shortening the stem has helped, and this may well be the final version – although it’s a powerful realisation than anything can be taken apart and used as components elsewhere. Sugar tong ends and resin – final version? 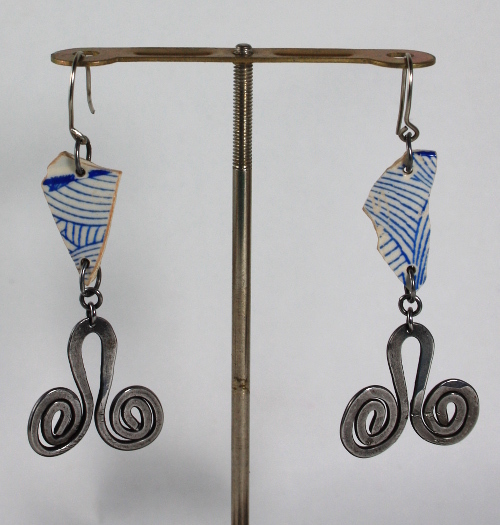 These agapanthus earrings aren’t going anywhere in this iteration. They’re based on a component in a proto-neckpiece done in Keith Lo Bue’s class (23-Apr-2017). They just look clumsy and lumpen. Less energy, less joy. The idea’s time will come, one day. … into a new stand for earring photography. The earrings shown have been seen previously (23-Apr-2017), and since then have received smaller jump rings and a good polishing. The details make a big difference. The next making is on-going. This started as the end sections of some sugar tongs (the handle section has been seen previously – yet again 23-Apr-2017). A long process – so a short photo essay. I’m still mulling over the final inserts – the photo looks better than life. 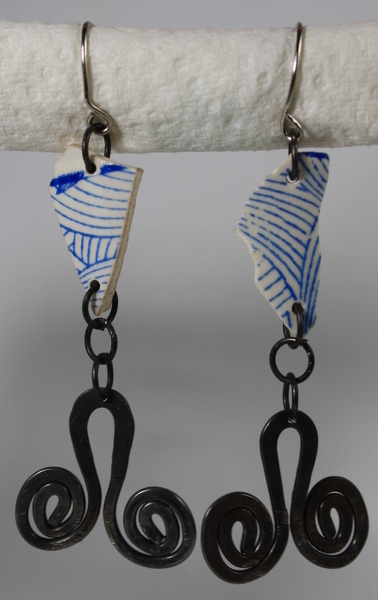 With fragments of ceramic mug, the proto-earrings looked like I was wearing souvenir spoons. Beads just added to the effect. A change to more pleasing ceramic didn’t help. Perhaps holes, so ceramic or bead doesn’t just squat on top. A mockup with beads from the stash. The fastening/hanging needs improvement. 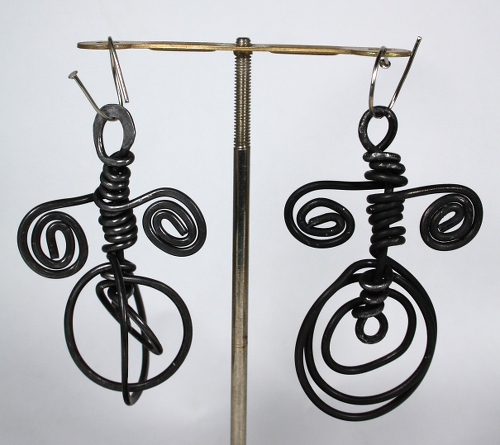 Next up some wire work, inspired by a spiral pendant by Alexander Calder (pictured here). The version on the right is the basic form. The one on the left has been cold forged (so slightly more polished and faceted, catching some light) and the lower section twisted to enhance three dimensionality. A bit heavy, and neither is good enough to become jewellery – maybe tree ornaments. 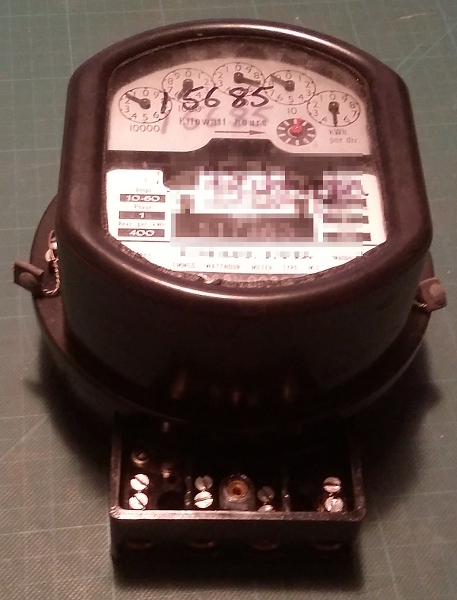 More practice needed, and perhaps a finer gauge wire. This was a varied exhibition, showcasing a wide variety of textile disciplines. Ellen King’s Etosha was inspired by her travels. Great expertise shown in this work, the felting, the intricate dyeing. I like the way imagery has been abstracted, such as the tracks of animals to a waterhole, and extending the work to include both wall-hanging and bowl. 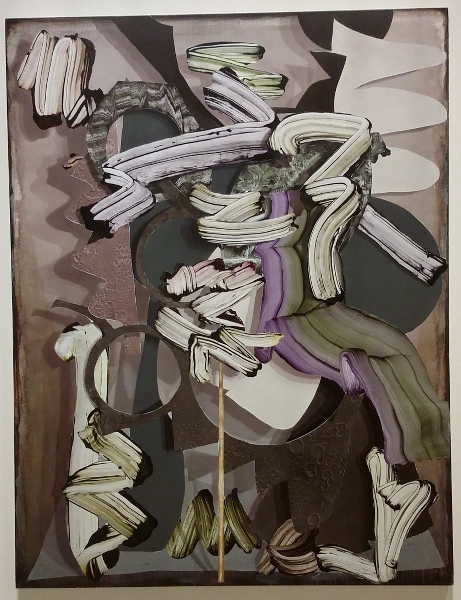 Variation in technique, and so scale, creates interest in Jillian Culey’s piece. One of the aspects I appreciate about basketry techniques is the opportunity to play with shadow, giving depth and richness. Saskia Everingham’s Light Seeds has an elegance and scale that attracted a lot of attention at the opening. The work was serene on its low plinth, with no evidence of the practical issues of how the lights were powered. It simply glowed. The combination of ceramic and basketry techniques in this work felt unforced and fully integrated. Colours and lines complimented each other, creating a complex and satisfying whole. The bright colour and lively movement of Pam de Groot’s felt work brought a moment of joy. This new biennial survey involves three major Sydney galleries and aims to present the latest in Australian art. In initial visits to AGNSW and MCA I was attracted to some works which used repetition and variation on a massive scale, underpinned by serious symbolism. Yonnie Scarce’s installation references the Maralinga atomic tests and the displacement of Aboriginal communities. The hand-blown glass forms, suggestive of people or bush food, move slightly in random air currents, gently clinking – so fragile, so precious. A midden, sign of long residence of Aboriginal communities, in a bed of copper slag, sign of the mining and commercial activities given priority today, tainting and destroying the land. The “myths and methods of colonisation” (quoting from AGNSW signage) continue. Other works that grabbed my attention claimed space, approaching an idea from multiple directions. Found rubber, galvanised steel, and bark – all incised by Gunybi Ganambarr in intricate patterns based on sacred clan designs. Forms echo. A history of use and misuse of the land. Gary Carsley’s installation was complex and included sound and video. Signage at the MCA references the artist’s investigations of what he regards as the artifice of European-Australian culture. I’m still thinking about this, wondering how it fits or challenges my understanding of my own heritage. A quick internet search turned up the definition “clever or cunning devices or expedients, especially as used to trick or deceive others”. Is my culture more rapacious, more contrived, less valuable than any other culture? I don’t want to accept that, and I don’t think I would want to categorize another’s culture in that way. Deep, ongoing flaws – yes. Dreadful damage done to others – yes. Artifice? Artifice as the sum total or dominant element of a culture? No. I was very taken with a mixed media installation by Nell at MCA. No photos yet. There have been a couple of lectures, bits and pieces, but I think that brings me as close to up to date as I’m going to get.